The Earth is a complex system of interacting physical, chemical and biological processes, and provides a natural laboratory whose experiments have been running since the beginning of time. James Lovelock in his various books on Gaia theory brought to the attention of many the importance of viewing earth in such a holistic way and he discussed some of the other earlier proponents of what we now call earth systems science in his Gaia books. Earth systems science treats the entire Earth as a system in its own right, which evolves as a result of positive and negative feedback between constituent systems and is being confirmed by computer models which are giving scientists the tools to develop and test hypotheses that explain the past and possible future behaviour of the Earth system. Lovelock went further and drew the analagy between the homeostatic nature of the earth system and that of life. 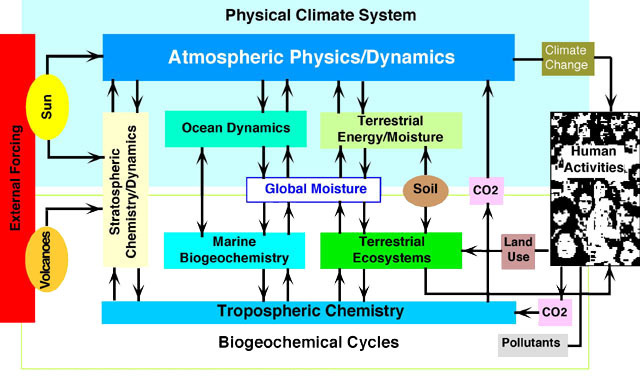 The Earth system is often represented by interlinking and interacting "spheres" of processes and phenomena. The atmosphere, hydrosphere, biosphere and geosphere form the simplest collection, though some would add the cryosphere as a special element dealing with polar regions and processes, and others would add the anthroposphere emphasizing human dimensions and impact on the planet. The difficulty with simplistic representations such as the one above is that they divide the system artificially continuing a deconstructed perception of the what is in reality a more holistic total Earth system in which no part should be considered in isolation from any other part. Chemistry, physics, biology, mathematics and applied sciences are all drawn upon in our attempts to understand Earth as an integrated system. John Harrison has drawn attention to the important role of materials flows because of the impact of their underlying molecular flows, the moleconomics of which have strong interactions with Earth Systems.